One of the primary elements missing when the Restoration started were the chair rails. When the chair rails were removed in ca. 1848, almost every piece was thrown out and so very little evidence survived that revealed what they looked like. However, by removing selected layers of post-Madison paint the profiles for many of the missing chair rails were recovered. While this was an incredibly useful tool, designs for several of the reconstructed rails were also developed with the help of two chair rail fragments found during the Restoration. One of the rail fragments had been reused in ca. 1848 as a nailer in the ceiling framing of the Dining Room and although it was not complete it still provided clear evidence to use for the design of the reconstructed rails. However, a major problem confronted the Restoration Team; they did not know where the fragment had been installed during the Madison-era. 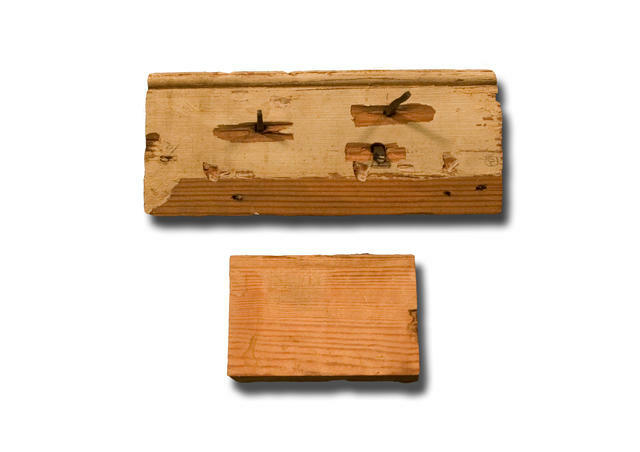 The two fragments of Madison-era chair rails found during the Restoration.